Cooking classes are a blast! Our Print Works Bistro and Green Valley Grill chefs will prepare three courses, paired with wine, utilizing fresh local ingredients and share plenty of witty cooking tips and recipes. Looking for a great gift idea for a foodie? 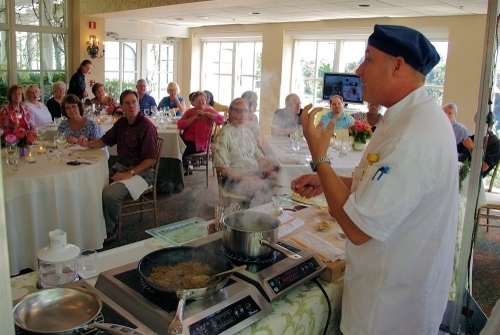 Tickets are now available for our 2019 cooking classes. Start with a seasonal cocktail during the cooking demonstration; then savor a three-course meal paired with some amazing wines. Tickets are $85 per guest plus tax. February 16, 12:30 pm Sold Out! Join Our Waitlist! February 16, 6:30 pm* Sold Out! Join Our Waitlist! May 11, 12:30 PM Sold Out! Join Our Waitlist! March 23, 12:30 pm Sold Out! Join Our Waitlist! March 23, 6:30 pm* Sold Out! Join Our Waitlist! June 8, 12:30 pm Sold Out! Join Our Waitlist! If you would like to purchase a single ticket without reserving a date please contact Lee Healy at 336-478-9126. For questions please, contact Lee Healy at 336-478-9126 or lhealy@qwrh.com. When you place an order, your card will be authorized and your order will be processed and charged within 1-5 business days.